The curriculum of the Golden Dawn reads at first as if it were designed for someone starting out with no experience of Magick whatsoever: it then goes on to instruct the initiate right from the beginning, up until the second order, which is when they really get into the practice of Magic proper. However, the Golden Dawn tradition also has the practice of not revealing the teachings of higher grades unto initiates of lower grades. This has the unfortunate effect of presenting an initiate with a corpus of theoretical knowledge, but not revealing its practical application. Unless the Neophyte realises that this is going to be made use of in due time, he or she may feel de-motivated at having to learn such a lot of material, purely for the sake of learning. There is a perfectly good reason for splitting the teachings of the Golden Dawn up according to different grades: it would be too difficult for everyone to be expected to learn everything at once. The case for enforcing strict secrecy, however, is harder to justify, especially when all of the Golden Dawn material has in fact either been published, or placed into archives which are accessible to the general public. I shall leave aside the fact that not everyone can be as erudite as Aleister Crowley! Note, however, that I claim that the new initiate only apparently does not take part in much practical magick. This is a misconception based purely on the way the material is presented. There are techniques of practical magick available to the Neophyte: they are already fairly well-known, and it should only take a few pointers to allow an individual to put them to better and more creative use. I am therefore writing this little essay purely for the benefit of new Neophytes, and to give them some consolation as they start on the Golden Dawn path. Take a steel dagger in the right hand. Face East. Dagger between figures, point up and say AMEN. DEITY NAME – YOD HE VAU HE – imagining that your voice carries forward to the East of the Universe. Holding the dagger out before you, go to the South, make the Pentagram and vibrate similarly the deity name – ADONAI. Go to the West, make the Pentagram and vibrate EHEIEH. Go to the North, make the Pentagram and vibrate AGLA. Return to the East and complete your circle by bringing the dagger point to the centre of the first Pentagram. Again make the Qabalistic Cross as directed above, saying ATEH, etc. 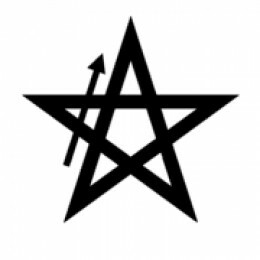 The Uses of the Pentagram Ritual. 1. As a form of prayer the invoking ritual should be used in the morning and the banishing in the evening. The NAMES should be pronounced inwardly in the breath vibrating it as much as possible and feeling that the whole body throbs with the sound and sends out a wave of vibration directed to the ends of the quarter. 2. As a protection against impure magnetism, the Banishing Ritual can be used to get rid of obsessing or disturbing thoughts. Give a mental image to your obsession and imagine it formulated before you. Project it out of your aura with the Saluting Sign of a Neophyte, and when it is about three feet away, prevent its return with the Sign of Silence. It is with point 2, a protection against impure magnetism, that we begin to see the key for making greater use of the LBRP as a technique of practical magick. I will observe that I myself have used it in the manner described to effect: I can testify well enough that it works. To remove obstacles to success. Spend some time in introspection, imagining what it is that you want to achieve in life, both spiritually and materially. Then analyse what is holding you back from achieving your goals. Imagine that your temple space represents your life in general – this is important. As in the above instruction, give a mental image to what you have identified as an obstacle: expel it from your aura with the Neophytes Signs, and perform the Pentagram Ritual, imagining that the mental image then disintegrates. Because you are identifying the Temple space with your Life, by performing the Pentagram Ritual in this way, you are in effect Banishing that obstacle from out of your life – opening the path for you to achieve success. To protect your home, your loved ones, your neighbourhood, your country, etc. The notion of identifying your own Temple-space in your imagination with whatever you wish to cast a protective circle around is a powerful one. So for example, to perform a protective ritual for your home, you may imagine that you may imagine that whilst you perform the Pentagram Ritual your the astral counterpart of your circle is expanding in diameter to include your whole house. This is a simple method of avoiding physically going around the entire building casting pentagrams – which might be impractical anyway. As long as the Ritual is done with the proper visualisations and with the proper intent, you will in fact be sending a powerful request to Divine Providence to protect your home anyway. Once you have understood this, you will be able to see that it is possible to call down Protection for a wide variety of people and things “at a distance” – by imagining that the astral counterpart of your circle grows to include that which you wish to protect. The circle of protection could ultimately be extended to include your whole country – or even the whole world, in which case the Pentagram Ritual then becomes a Ritual to protect us all from negative forces such as crime, terrorism, warmongering, environmental hazards, and so forth. This sort of ritual is very conducive to group-working, or if a large number of initiates all over the world perform a co-ordinated effort, each imagining the same thing as they perform their Pentagram Rituals. 3. It can be used as an exercise in concentration. Seated in meditation or lying down, formulate yourself standing up in robes and holding a dagger. Put your consciousness in this form and go the the East. Make yourself “feel” there by touching the wall, opening your eyes, stamping on the floor, etc. Begin the Ritual and go round the room mentally vibrating the words and trying to feel them as coming from the form. This is not practical magick per se, but its value is so important I thought I should stress it anyway. Becoming proficient in Astral Projection is a highly useful skill, which will lead on to the development of other psychic powers in due course. I therefore believe that Neophytes should be practising rudimentary Astral Projection – and, following the above instruction, they should practice it at least until they are comfortable with performing the whole Pentagram Ritual whilst out of the body. The ability to perform the LBRP on the astral is useful in itself – as unlike on the physical plane, the effects of the ritual will be immediately visible. A lot of the advanced work of the Golden Dawn consists of actively exploring the Astral Plane, so it is vitally important that initiates are able to protect themselves suitably from the outset. A good book for the beginner, is Ophiel’s little treatise: the first two techniques he describes are suitable for complete beginners, whilst the second two are slightly more advanced. Also useful would be my own treatise on Lucid Dreaming. (See Bibliography). A technique to be incorporated into magic rituals generally – as a means of raising power. Moreover, in his essay The Art of True Healing6, Regardie not only emphasises this aspect of the Ritual, but also goes on to outline how it may be extended to become a simple method of practical magic. He also develops this idea in another book, How To Make And Use Talismans (see Bibliography). I shall thus summarise briefly the applications of the Middle Pillar Ritual. Moreover you will be able to feel all of the above. To direct the power thus raised to healing purposes, with the same rhythmic breathing which you have employed in the Middle Pillar Ritual itself, now focus on the part of the body afflicted, and imagine that pure white light is accumulating there. Over the course of around half-a-dozen breaths let this visualisation – and feeling – build up, imagining with it the light is bringing with it healing properties. This method may be used as self-healing, or it can be used to with others as well, by performing the Ritual with them. The method which Regardie recommends is not dissimilar to what is elsewhere called “Colour Breathing.” Before you begin, arrive at a firm idea of what it is you want to achieve. Generally you should be able to relate your objective to the traditional associations of the Planets in Astrology. Now it so happens that in the Golden Dawn, each planet is associated with one of the colours of the spectrum, and with a Divine Name. This is straying from Neophyte-territory, into concepts usually associated with slightly higher grades, so please forgive me if this starts to sound somewhat sophisticated. Suffice to say, Regardie’s idea is that, on performing the Middle Pillar Ritual, one should then spend some time visualising one’s Aura as being filled with the colour associated with the planet in question, at the same time vibrating the associated Divine Name. This serves to attract to oneself the forces of that planet, enabling you to achieve your desired objective. There is in addition a higher teaching that there is an appropriate colour for each of the Sephiroth (as well as Daath), the Elements, the Planets and the Signs of the Zodiac in each of the four Qabalistic worlds – one hundred and forty in total! However, as our present theme is “simplicity” I shall leave you for the moment with the seven above. The Method of charging and using Talismans is almost exactly the same as the form of simplified magic above. Probably the most difficult part of the operation will be to physically construct the talisman in advance. Regardie outlines a number of methods, including using the images of the Tattvas to create appropriate designs. There are other more traditional methods, which are derived from classic works such as Agrippa’s Three Books of Occult Philosophy. Once one has physically created a suitable Talisman, there are two methods given for charging it. One of these is actually a more advance method normally used by Adepts; the other is that based upon the Middle Pillar Ritual above. The procedure is: whilst holding the Talisman, perform the Middle Pillar Ritual, and invoke the magical force corresponding to the Talisman in the manner described. Now continue by imagining that the Coloured Light which in your aura is accumulating in the Talisman itself. As before, this visualisation should take place as one continues to breath rhythmically, for at least half-a-dozen breaths. The Talisman is thus charged: and should be stored safely whilst wrapped in silk or linen. Regardie does not appear to go into detail about what to do after the Talisman has fulfilled its purpose, although the standard practice is to de-consecrate it. This can be done by skilful application of the Lesser Banishing Ritual of the Pentagram – as described previously. Published as part of Foundations of Practical Magic – see Bibliography. Agrippa, H C, 1533, Three Books of Occult Philosophy, available at Twilit Grotto. Ophiel, 1961, The Art and Practice of Astral Projection, Samuel Weiser, New York. Regardie, I, 1972, How To Make and Use Talismans, The Aquarian Press Limited, Wellingborough, Northants. Regardie, I, 1979, Foundations of Practical Magic, The Aquarian Press Limited, Wellingborough, Northants. Regardie, I, 1989, The Golden Dawn, 6th ed., Llewellyn, Minnesota. Regardie, I, Cicero, C, Cicero, S T, 2003, The Middle Pillar – the balance between mind and magic, 3rd ed., Llewellyn, Minnesota.